Venus Williams is officially an alumna of Indiana University East. Williams was presented with her diploma on August 14 at IU East, located in Richmond, Ind. Williams, who earned her Bachelor of Science in Business Administration degree, completed her last online courses at IU East this summer and was able make her first visit to campus as she traveled to the Western Southern Open (WSO) August 15-23. The WSO tournament was held at the Lindner Family Tennis Center in Mason, Ohio, located about an hour and a half from the IU East campus. 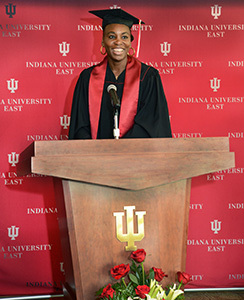 Venus Williams received her Bachelor of Science in Business Administration degree from IU East on August 14. In 2007 Venus earned her associate degree in fashion design from the Art Institute of Fort Lauderdale. Williams enrolled in IU East’s online degree completion program in 2011. From day one, Williams said IU East has felt like home, a characteristic of the university that resonates with many of the 4,500 students. Williams said she was able to apply her academic lessons and skills she learned in class to her businesses right away, allowing her to work better with staff and to be more strategic. During the diploma presentation, Williams followed the commencement tradition of flipping her tassel to the left, signifying that she is now a graduate. IU East Chancellor Kathryn Cruz-Uribe said the campus was honored to host Williams and to present her diploma. “We congratulate Venus on earning her degree and are delighted to welcome her to the IU East Alumni Association with over 8,000 fellow graduates,” Cruz-Uribe said. Williams is the first to graduate under an agreement between IU East and the Women’s Tennis Benefits Association (WTBA). Lisa Grattan from the Women’s Tennis Benefits Association (WTBA), explained that about five years ago they collaborated with the WTA to create a partnership with IU East. Currently, 15 of the WTA’s players are enrolled in IU East online degree completion programs. Additionally, IU East signed a similar agreement with the ATP in June 2015. The ATP is the governing body of the men’s professional tennis circuits. Both agreements provide the opportunity for players to professionally train and play tennis while completing their bachelor’s degree online. IU East’s online degree completion programs offer the high quality of an Indiana University degree to students throughout Indiana, nationally and internationally. IU East offers 13 options for students to complete their bachelor’s degree or certificate online. Williams said the partnership provided women in the WTA with the choice to pursue something outside of the game of tennis and to expand their horizons while giving back to the world. It also builds comradery among the players as they discuss classes and academic projects or assignments with each other. Venus Williams talks with David Frantz, dean of the School of Business and Economics, and Chancellor Kathryn Cruz-Uribe. Williams visited the IU East campus August 14. She has been an online student at IU East since 2011 and recently completed her Bachelor of Science in Business Administration degree. While in Richmond, Williams toured the campus and spoke with students about courses. She also had an opportunity to meet members of the faculty, staff and community. “I greatly admire Venus and her dedication to complete her online degree while continuing to play professional tennis, train, and run a business full-time. I can only imagine how challenging this has been, and I know that Venus has been a great role model for the other WTA players enrolled at IU East as well as to students in her classes,” Cruz-Uribe said. School of Business and Economics Dean David Frantz has worked with Williams since she first enrolled in online classes. Frantz addressed Williams during the diploma presentation ceremony, commenting on Williams as a student, as a person and as a graduate. Frantz said that Williams was an awesome student, approaching her courses with drive and determination. Frantz added that he has been impressed with Williams throughout her time as a student, pointing to her optimism and gracious personality. “In working with other students, she encouraged her classmates. She had the ability to lift people up and that was great to see,” Frantz said. 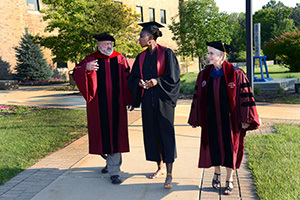 Williams thanked Frantz, the Office of Admissions, faculty and staff for their assistance throughout her experience during her remarks as she received her degree. “It was just a wonderful experience. I love being a Red Wolf. I love this school and I’m so happy to be a part of it,” Williams said. The WTA is the global leader in women’s professional sport with more than 2,500 players representing 92 nations competing for a record $129 million in prize money at the WTA’s 55 events and four Grand Slams in 33 countries. More than 5.4 million people attended women’s tennis events in 2014 with millions more watching on television and digital channels around the world. The 2015 WTA competitive season concludes with the BNP Paribas WTA Finals Singapore, presented by SC Global, from October 23-November 1, 2015 and the WTA Elite Trophy in Zhuhai, China, from November 2-8, 2015. Further information on the WTA can be found at: wtatennis.com; facebook.com/WTA and twitter.com/WTA. Indiana University East has an enrollment of nearly 4,500 students. IU East is both a traditional campus that excels in innovative learning options and a virtual campus with select online degree completion programs. The university’s customized bachelor’s and master’s programs – a portfolio of over 50 degree program options – anticipate the growing needs of citizens in the region, state and nation. IU East’s online degree programs offer the high quality of an Indiana University degree to students throughout Indiana, nationally and internationally. IU East offers 11 options for students to complete their bachelor’s degree online in English with an emphasis in Technical and Professional Writing, Mathematics, Natural Science and Mathematics with a Mathematics Concentration, Communication Studies, Business Administration, Criminal Justice, Political Science, Psychology, General Studies, and an RN to BSN Mobility Option. IU East also offers a Graduate Certificate in Composition Studies and a Graduate Certificate in Mathematics.